Between 03rd-07th December the next trial against the lawyers will take place. In this text you can find detailed information about the process. Don´t let the lawyers alone. Let´s defend the defence. Progressive Jurists Association’s (ÇHD) 17 imprisoned lawyers were released on the trial hearing session held on September 14th 2018. Upon the objection of the State Persecutor, on September 15th 2018, the committee constituted by the same judges lifted the release decision for 12 of the lawyers. This time, a decision to “arrest for imprisonment” which is not written in the Criminal Court Law, was taken. The consequence of the mentioned “decision, the lawyers Aycan Çiçek, Engin Gökoğlu, Behiç Aşcı and Aytaç Ünsal were arrested on on September 15th, and illegally “imprisoned” on September 16th 2018-in a precedent unseen to this day-by so called 37th Heavy Penal Court, in fact Istanbul’s 29th Heavy Penal Court committee. As for the ÇHD’s general president, lawyer Selçuk Kozağaçlı, on September 16th 2018 he went to the Court on his own, got arrested and on September 17th 2018 imprisoned by the committee formed by the Court’s judges Akın Gürlek, Serkan Baş and Erol Güngör. During the “trial” of Kozağaçlı, the police removed the lawyers by force from the courtroom, and being left without lawyers, in the technical sense fundamentally without a hearing, it was resorted to the illegal “arrest for imprisonment” decision directly. Among those who formed the committee for this decision, Akın Gürlek’s permanent jurisdiction over the presidency of the 37th Heavy Penal Court was published on September 19th 2018. Because of this, it is not known if Kadir Alpar who on September 17th 2018 acts as a proxy for the presidency of the 37th Heavy Penal Court was on duty or not, neither how Akın Gürlek came to preside the court. From the process we tried to summarise below, it is clear that 37th Heavy Penal Court’s judges Kadir Alpar, Serkan Baş and Erol Güngör formed a heavy political repression. Likewise, the downgrade of Kadir Alpar who acted as a Court presidency proxy and of the member judge Serkan Baş to perform other court duties via the Judge and Prosecutor Committee’s decision related to the permanent jurisdiction published on the September 19th 2018., is a clear proof of our claim. 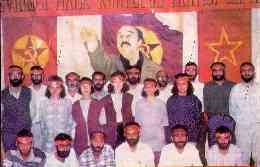 After this whole process contrary to the law rights, it is impossible to say that the judges who were previously on duty for the imprisonment hearing of Kozağaclı, Akın Gürlek and Ferhat Gülbağça who joined later on, were independent, impartial and appointed in a way appropriate to the natural law judge principle. In a way that corroborates our claim, the committee of Istanbul’s 37th Heavy Penal Court composed of president Akın Gürlek, member judges Ferhat Gülbağça and Erol Güngör, while performing the hearing in the absence of witnesses and defenders, changed the previously established time and place for hearing. It is not possible to reconcile this situation with law rights, independence of the law judges and impartiality. 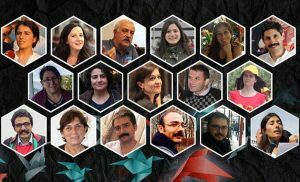 15 members of the Progressive Jurists Association (ÇHD) and the part of them who are workers of the People’s Law Office, two days before the hearing of their clients Nuriye Gülmen and Semih Özakça, on September 12th were imprisoned after being arrested. In the arrest warrant was the decision to be included in the investigation by gathering proofs about Nuriye Gülmen and Semih Özakça. With the arrest of the general president of Progressive Jurists Association Selçuk Kozağaçlı and lawyer Yaprak Türkmen within the scope of the investigation the number of arrested lawyers increased to 17. The imprisoned lawyers were sent to 8 different prisons in 6 separate provinces of Turkey. As for Selçuk Kozağaclı and Yaprak Türkmen, they were placed in Istanbul Silivri nr. 9 High Security Prison’s one-man cells for persons sentenced to aggravated life sentences. On March 3rd 2018 public hearing was openned for 20 lawyers in 37th Heavy Penal Court under case file number 2018/84 and law indictment 2018/12766. 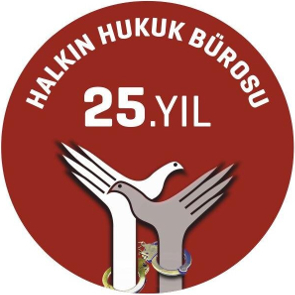 Upon examining the law indictment it is understood that the continuation of what began with the inference pertaining to the claim that People’s Law Office is an association of the illegal organisation DHKP/C based on the evidence in the public hearing of 8 of the 20 lawyers with the case file number 2014/117 which continues from 2013 until today, appears a declaration of a suspect person B.E. who was taken under arrest within the scope of a different investigation. From the point of view of many law suspect lawyers the accusations were not personalised, statistic reports were prepared related to how many times have the lawyers taken the procedural acts of their arrested and imprisoned clients, camera recordings taken via legal request from the files in the trials they were appointed to, were directed as a accusation. One different accusation was shaped in a way that the objective of the lawyers in the collective hearings such as the Soma and Ermenek mine massacres was to create collective annoyance by following the instructions of the illegal organisation. Finally, legal press statements they participated in, social media and newspaper news about them written by 3rd parties were put into the accusation. The trial of 17 lawyers imprisoned for a year that was held between September 10th and 14th started in the Istanbul’s Bakırköy Court as decided by 37th Heavy Penal Court. In the first session held on Monday, September 10th 2018. 17 imprisoned lawyers were beaten by the gendarmes in front of the court committee, their clothes were torn to pieces, and handcuffed inside the courtroom. In spite of problems not appearing in the following days, the decision was taken by the court to continue the trial in the courtroom adjacent to the Istanbul Silivri Prison Campus. In the 5 day long hearing, over 300 defense lawyers were present, 17 lawyers as suspects and 30 lawyers as defense spoke and declared, in average of 9 hours of every day nearly 45 hours of video conference (SEGBİS) recordings was made. On the trials session held on September 14th 2018, by the means of the interim decision number 16, together with the decisions taken about the existing state of the evidence in the file for each of the imprisoned suspects; about the likelihood of the change of the quality of the offense; suspects’ defense declarations being taken and the suspects having defense attorneys; imprisonment measures; the time spent in imprisonment; recourses sent to Constitutional Court and European Court for Human Rights related to the topic of imprisonment; while taking into consideration measures in the trial aimed that will be provided together with enforcing the decisions about the judicial control in this phase, one by one justly release decision was made. From the standpoint of the judicial control devisions, by the means of a petition that is to be sent to the Court within 7 days was made determined that the legal way is open, and itwas agreed upon carrying it out on the next hearings on February 19th to February 20th 2019 at 10:00h. From the standpoint of the State Prosecutor’s rejection of the release decision, no decision was established regarding the legal way being open. The decision was made public on Friday, September 14th 2018 around 22:10 o’clock. After disclosing the decision to release the suspects, the 9 lawyers that were held prisoners in Istanbul’s Silivri Closed Prison number 9 were released on September 15th 2018 at 6:30 in the morning, after illegally waiting for 8 hours. The same way, 8 lawyers held prisoner in Istanbul’s Bakırköy Closed Prison for Women were released around 4:30 next morning, after 6 hours of waiting. In the study made via National Judiciary Network (UYAP) system, it is understood that the hearing prosecutor objected the decisions to release 17 lawyers one by one, on September 15th 2018 around 1:00 o’clock in the morning. It is clear that the reason for the illegal waiting to release our colleagues is the illegal way to conclude the work on bringing the law protests to conclusion. The committee of the 37th Heavy Penalty Court met in a way outside of the procedure on September 15th 2018around 16:30 o’clock over the prosecutor’s law protest and half an hour later unanimously issued the arrest warrant for 12 released lawyers. As for the other 5 lawyers, prosecutor’s objection was rejected and upon being evaluated it was sent to Istanbul’s 1st Heavy Pentalty Court. On Friday, September 15th 2018, after 17 lawyers were released, in the building of the Istanbul Bar in the Istiklal Street, a gathering was planned by our colleagues. Among the lawyers that were arriving in order to participate the celebration were Aycan Çiçek, Aytaç Ünsal, Engin Gökoğlu, Behiç Aşcı. They were arrested while entering the building by the police belonging to the Directorate of Anti-Terrorist Struggle (TEM) on the grounds of arrest warrant being issued. The same day, lawyer Ahmet Mandacı was arrested by the police in the house in Çanakkale province where he was staying with his family. On Sunday, September 16th 2018, while it was required to bring Aycan Çiçek, Aytaç Ünsal, Engin Gökoğlu and Behiç Aşçı who were among the lawyers arrested the day before, to the Istanbul’s 29th Heavy Penal Court which was on duty, in a way unseen until this day, they were taken to the 37th Heavy Penal Court. However, 37th Heavy Penal Court’s committee was not composed of it’s own judges, but illegally by the judges of the 29th Heavy Penal Court. In other words, the imprisonment of our clients was not realised by a legally constituted court. The permission was not given to meet with the lawyers inside of the court building. The arrested lawyers were dragged by the police and brought into the surveillance room inside of the court. Before the hearing started, it was requested of the court president for the defense interview with the arrested lawyers in appropriate environment, but this request was rejected. After the hearing started, if it was to be requested once again to provide the defense interview the lawyers and to remove the armed TEM police who filled the half of the courtroom, State Prosecutor expressed his view that the request for court’s security personell to take over the courtroom was appropriate. The requests were rejected by the court without any reason. The committee constituted by law judges was challenged by defense attorneys upon understanding under such conditions independent decision cannot be made. The court committee rejected the demand, and the defense attorneys objected this decision. The court made the decision to imprison four lawyers. Within the same day, lawyer Ahmet Mandacı who was arrested based on the arrest warrant in Çanakkale province, again while having to be brought to 29th Heavy Penal Court on duty, he was connected via viedo conferencing system with the 29th Heavy Penal Court’s committee illegally constituted by the 37th Heavy Penal Court’s judges. While the hearing was in progress, the general president of ÇHD Selçuk Kozağaçlı who was among the lawyers affected by the arrest warrant decision, presented himself while entering the courtroom and expressed the desire to participate in the hearing and that he learnt about the warrant to arrest him. After establishing his identity, the court committee which required the hearing to continue, abandoned the courtoom in an incomprehensible way without saying a work. The committee which came to the courtroom again after a while, said that they have taken a break because the courtroom order has been violated. Then they abandoned the courtroom again. While waiting for the hearing to continue, a police commander gave an order to remove the lawyers from the courtroom and approximately 30 lawyers were beaten and taken out. As for Selçuk Kozağaçlı who requested to participate in the hearing, he was arrested and taken to the TEM branch of the Istanbul’s Security Directorate. After removing the lawyers from the courtroom, they were obstructed from reentering by locking the courtroom door. At the end of the hearing which continued after throwing the lawyers out by beating, it was decided to imprison lawyer Ahmet Mandacı. In the morning of Friday, September 17th 2018 around 9:00 o’clock, lawyer Selçuk Kozağaçlı was brought to the court by TEM police officers, and after waiting for approximately 5 hours he was brought in the Istanbul’s 37th Heavy Penal Court’s courtroom. This time, it appeared that the court president has taken a leave, and in his place Istanbul’s 26th Heavy Penal Court’s president Akın Gürlek was temporarily assigned. The requests by the defense attorneys to talk to Selçuk Kozağaçlı in an appropriate environment and to remove the armed TEM police from the courtroom, were rejected by the court president. Upon the order of the court president, lawyer Nergiz Tuba Aslan who said that this situation is unlawful and repeated the demand to talk to the accused, was beaten by the police, taken out of the courtroom, and the hearing started without the defense lawyer. The court president asked Selçuk Kozağaçlı what will he say, however it was decided to imprison him within 3 minutes without appending to the register his recusation request and anything else he said, and without reckonising his right to have present his defense attorney. Without being given any example from the court records, the lawyers that were in the audience area were started being removed from the courtroom by the police and beating, acting upon the orders of the court president. Lawyer İlknur Alcan’s leg was injured. In the evening of Tuesday, September 19th 2018, 37th Heavy Penal Court’s president, being a judge of 18th Penal Court of First Instance, had his place of duty changed to a judge of Commercial Court via enactment of Council of Judges and Prosecutors. 26th Heavy Penal Court’s president and it’s members who just one day before did not reckognise the right of Selçuk Kozağaçlı to have his defense present and made the decision to imprison him, were assigned to Istanbul’s 37th Heavy Penal Court. It is not a coincidence that the judge coming via temporary duty assignment by the Justice Commission one day later becomes appointed by the Council of Judges and Prosecutor’s authority enactment. It is an indication that the process was directed by different will. While doing a trial without the presence of suspects and defense, 37th Heavy Penal Court’s committee constituted of president Akın Gürlek, member judges Ferhat Gülbağça and Erol Güngör changed the previously determined day and place of the next hearing. It is impossible to reconcile this situation with the law, impartiality and the independence of justice. On October 5th 2018, 37th Heavy Penal Court has rejected all demands of the defense attorneys to rule the “hearing” dated September 25th as non-existence, and to revert all decisions contrary to the law in accordance with CMK’s paragraph 198. The objection to the the arrest warrant dated September 15th, 16th and 17th 2018 filed by the defense attorneys were rejected on September 25th 2018 on the grounds that “decisions being according to the law there is no basis for the change”. The conclusion of the study sent by the 1st Heavy Penal Court on September 27th 2018 after the case examination, rejected the demands by copying the arrest warrants dated September 15th 2018, one by one. Among the arrested lawyers, Ahmet Mandacı was sent to Edrine F-type Prison, Aytaç Ünsal to Burhaniye T-type Prison, Aycan Çiçek to Düzce T-type Prison, Engin Gökoğlu Tekirdağ nr.2 T-type Prison, SelçukKozağaçlı and Behiç Aşçı to Silivri nr. 9 High Security Prison. Selçuk Kozağaçlı who was held in the heavy isolation conditions, was once again put into a single person cell upon rejecting the objection to his release. Ahmet MANDACI, Aycan ÇİÇEK, Ayşegül ÇAĞATAY, Aytaç ÜNSAL, Barkın TİMTİK, Behiç AŞÇI, Didem BAYDAR ÜNSAL, Ebru TİMTİK, Engin GÖKOĞLU, Naciye DEMİR, Özgür YILMAZ, Süleyman GÖKTEN, Şükriye ERDEN, Yağmur EREREN EVİN, Zehra ÖZDEMİR who were arrested on September 12 2017, were imprisoned on September 21st 2017 after 8 days under arrest. Because of having a small child which required care, Ezgi ÇAKIR was released under judicial control. As for Günay DAĞ and Av. Oya ASLAN, the arrest warrant was removed. 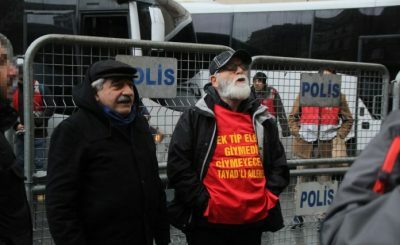 After being unjustifiably removed from their jobs via state of emergency (OHAL) government decrees (KHK), academician Nuriye GÜLMEN and teacher Semih ÖZAKÇA carried out an action for 120 days in front of the Human Rights Monument in the Ankara province, and started a hunger strike with the demand to be reinstated to their work, on March 9th 2017. While carrying out their protest, Gülmen and Özakça were imprisoned on May 23rd 2017 under the claim of membership in an illegal organisation, and taken to the court on September 14th 2017. Lawyer Selçuk KOZAĞAÇLI was arrested on November 8th 2017 within the scope of the same case investigation. He was imprisoned after 5 days under arrest on November 13th 2017. Yaprak TÜRKMEN was also arrested on December 18th 2017 within the scope of the same case investigation, then imprisoned after 2 days of arrest on December 20th 2017 by the Justice Court. With the decision number 17 of the court’s session dated September 14th 2018 it was unanimously decided that, in accordance to the Criminal Law (CMK) paragraph 109/3-(b), the suspects will orderly give signature every Monday between 8:00 and 0:00 o’clock at the police unit nearest to their address. With the decision number 18 it was decided that, in accordance with the CMK paragraph 109/3-(a) suspects are prohibited to leave the country.